FK19-21, IV1-28, 30-37, 40,54,63. KW1-3, 5-14 PA20-49, PA60-78. PH15-26, 30-44, 49,50. BEAUTIFUL DRIP GLAZED VASE BY SCHEURICH. LOVELY SHADES OF AQUA BLUE. IDENTIFIED BY NO ON BOTTOM WHICH READS W GERMANY 242-22. A 1960s 1970s, West German, Fat Lava. Fat Lava Vase. It is in very good condition. West German. Vase number 523 18. Lovely Mid Century Vase. West German Pottery. Blue and Orange colourway. As shown one of the WGP 203-26 shoulder vases. This one is a little under 27 cm high with a raised lava effect square pattern over a light orange gloss glaze. This one is by Scheurich and is in shades of matt orange and brown with dark brown inside. 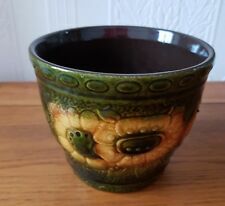 I am thinning out my West German pottery collection as I just do not have enough room to display it all and am getting fed up with tripping over boxes of pots when I have to go in the loft. W.Germany on the bottom and also has Scheurich - Keramik on it. Scheurich – Identification. Scheurich always used white clay and marks are almost exclusively moulded. The form number markings are always 3 digits long and followed by the height to the nearest cm (with one exception form 405 which is marked as 13.5cm). SCHEURICH 806-14. This Mid Century Modern Planter features a Sage/Moss Green Base Coat with a Wavy,Band of White Glaze over it. MID CENTURY MODERN PLANTER. This one is by Scheurich Keramik and is shades of very dark brown and stone. It is is excellent used condition. The plant is not included. The glazed bottom is embossed 523-18 W GERMANY with a ring of white clay, typical of Scheurich pieces.Notably there is no Scheurich Keramik marking as this did not start until the 1970s. This is a beautiful example of 1960s understated Scheurich style. I believe that it dates back to the 1970’s as it has the back-stamp mark 485-26. Design: Onion. Material: Stoneware. Item: Vase. Era: 1970’s. Made: West Germany. Approx weight: 1.2kg. Height: 27cm. This one is by Scheurich Keramik and is shades of very dark brown and orange. This one is quite unusual as it has a foot like a wine glass at the bottom. There are traces of the original label on one side. Great example of Scheurich Keramik Mid Century vase in striking, eye-catching red glaze with blue lava. 210-18. Height approx 18cm. It is marked to base 210-18 W. Germany and it is in an good undamaged vintage condition, with some irregularities to finish as you should expect with any Fat Lava piece. Any irregularities are part of the production. Good vintage condition. Please see photos which form part of description. If you have any questions please ask. Large West German Pottery Vase. NUMBER ON BASE (CAST AND HEIGHT) 289-27 - 27CM TALL. Rumtopf White Ceramic Scheurich . Condition is Used. Dispatched with Royal Mail 2nd Class.